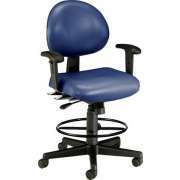 Drafting Chairs & Stools: Shop From Our Great Selection! What is a good stool style for an art studio? When you need flexible seating that can reach tables of various heights, drafting chairs are an excellent option. They are comfortable to sit in and provide easy access to necessary items. A swivel mechanism enables you to reach many items without having to get up or twist around into an uncomfortable position. Hertz Furniture&apos;s selection of drafting stools comes from reliable manufacturers including OFM, Mayline and Academia. 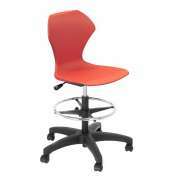 They promote physical comfort while bringing some attractive furniture into a study or work space. 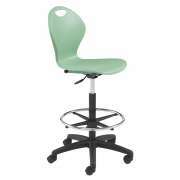 With a selection of styles, colors and materials, you can find some great swivel stools to fit any price range or purpose. 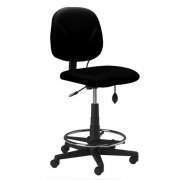 Why should I get a drafting stool? Although a basic stool design will provide access to high counters, it doesn&apos;t offer the same flexibility as a swivel model. When sitting in a drafting chair, one can simply glide from side to side in order to reach things that are slightly further away, rather than squirming, straining and getting into uncomfortable positions. This feature is ideal in a collaborative work setting because it enables professionals or students to rotate smoothly to the side and face others while talking to them. 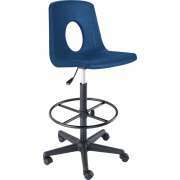 In an art classroom with high counters, swivel stools are essential. Although some students might be tall enough to reach higher work surfaces, it is important to ensure that each pupil can sit comfortably and easily see what they are working on. 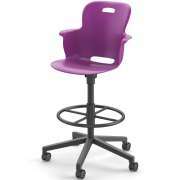 Accidents and spills are much more likely to happen if students don&apos;t have seating at the proper height. 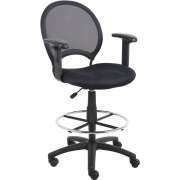 How can I make sure my drafting chairs are ergonomic? 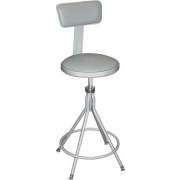 Drafting stools come with a variety of supportive features that promote comfortable and healthy positioning and ergonomics. 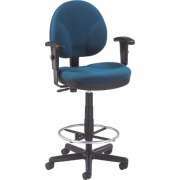 When stools are used in a professional environment such as a research lab or engineering firm, employees will spend many hours sitting in them. When this is the case, it is very important to make sure that drafting chairs include adjustable ergonomic features that will enable each individual to achieve a perfect fit. The pressure that is placed on different parts of the body when a person is seated in one place for long periods of time can lead to pain and injuries. 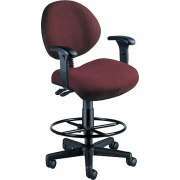 With proper padding and positioning, professionals can avoid discomfort while remaining productive in the workplace. 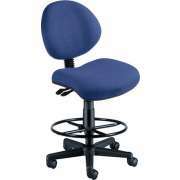 Many office stools feature thick cushioning which is specially designed to fit the contours of the body. With this arrangement, it is easier to maintain proper positioning and eliminate potential hazards. 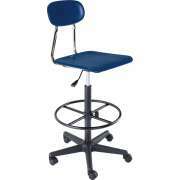 Because drafting stools stand high above the ground, a scientist or student will not be able to work with their feet resting flat on the floor while seated at one. 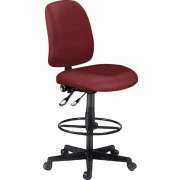 Many of our stools have foot rings which provide an accessible place for feet while at work. Adjustable-height seats ensure that everyone can position themselves to access counters and reach the foot ring. 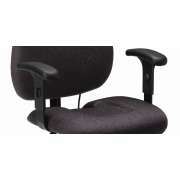 For all-around support, there are also a number of models which include adjustable armrests. 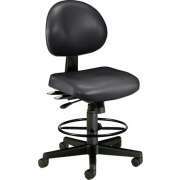 Are there mobile drafting chairs? Industrial stools tend to be large and sturdy, which is great while they are in use but can pose a challenge when it comes time to transport them. If you know that your stools will need to be moved around often, a model with casters will make the whole process much easier. Rather than having to lift heavy furniture, it can simply be rolled into the desired position, whether it is needed on the other side of the room or the other side of the building. What kind of upholstery is good for swivel stools? 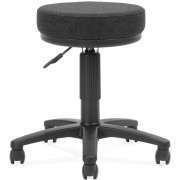 Swivel stools are available in a varied selection of seat materials. 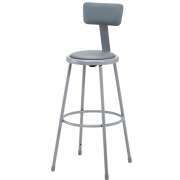 In the educational setting where students will be using them as lab stools for one or two classes at a time, hard plastic or polypropylene stools are highly recommended. Both materials are low-maintenance and hard plastic is super durable. In a workplace such as a research lab or medical facility, you need to consider comfort, cleanliness and durability when choosing furniture. Anti-microbial vinyl stools are an ideal choice because they include the padding and adjustable support that is needed all day long, while preventing germ build-up and facilitating easy cleaning. 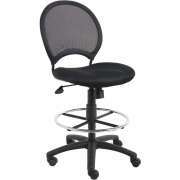 Mesh stools are another great option because they promote airflow. We know that your students and employees deserve the best seating out there. 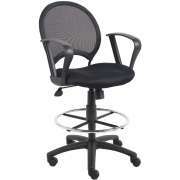 That&apos;s why Hertz Furniture offers great drafting stools and office stools at budget-friendly prices. If you are deliberating over a number of models or particular features, don&apos;t hesitate to call the Project Solutions team for free, expert project-planning advice.